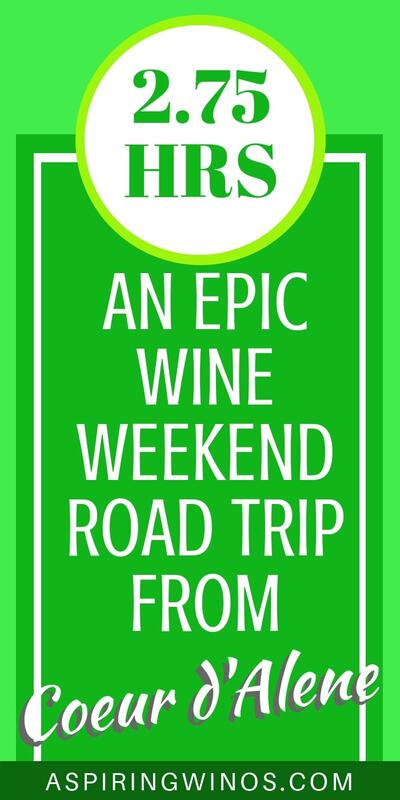 “Where can we go on a road trip for an easy weekend getaway?” is a question I often find myself asking. On my lunch break, I’ll find myself on Google Maps, attempting to discover a new destination within about 5 hours of where I live, then trying to find out if there’s a reason to go there at all. Do you do that too? 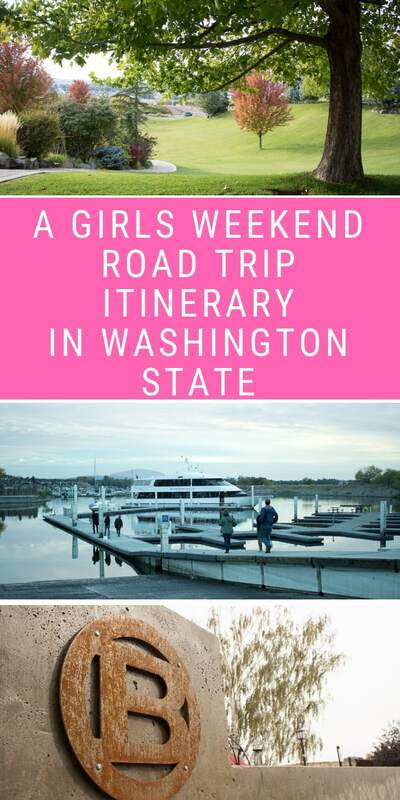 If you do, you’re in luck, because I’ve got a fantastic road trip itinerary for you, that’s a perfect weekend away from a ton of cities in the Pacific North West. I took my Google Maps prowess and put it to work for you, so you don’t have to! Unless you want something to do on your lunch break, then by all means. Plus, we can totally be friends. 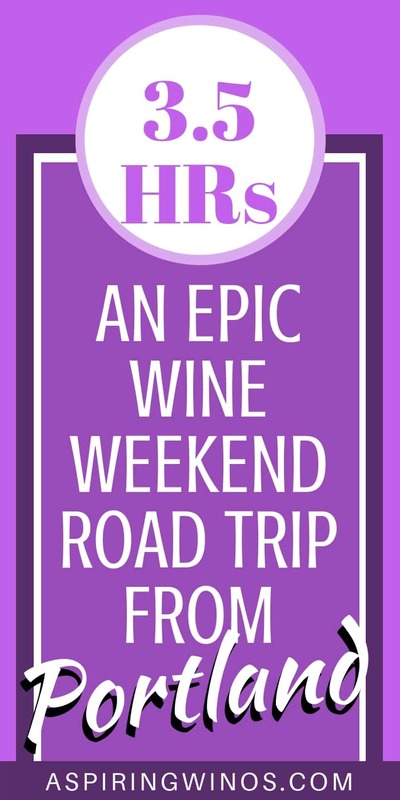 What if I were to tell you about a place that offered gorgeous wineries (and wines! ), 11 golf courses (for people who are not me), wine cruises, The Manhattan Project National Historic Park (yes, THAT Manhattan Project) oh, and super-delicious chocolates. I’m probably going to talk about the chocolates a lot. All in all, it’s a very accessible destination, perfect for jumping in the car after work on a Friday. Plus, as I’ve mentioned already, they have wine there. Yum. 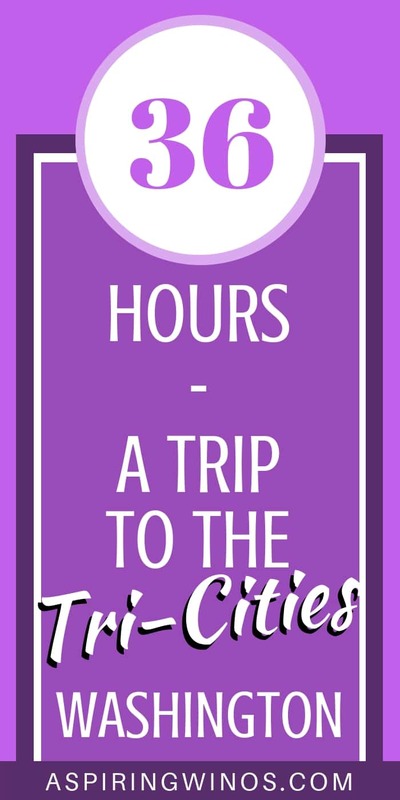 If you’re coming from further afield, you can catch a puddle jumper to the Tri-Cities Washington Airport, out of Seattle. PS: Wine Flies Free on Alaska Airlines. Load up the car and head out! Hook yourselves up with some good tunes, or check out a wine podcast like Decanted. Your destination is the Richland Courtyard by Marriott or the wine-tourism focused Lodge at Columbia Point. Both hotels have rooms that overlook the water and you want to snag one if you can! This little nook of the Columbia River is next to nature preserves, golf courses and a quiet marina, making it a wonderfully relaxing place to stay. The Marriott is a few dollars less, but doesn’t include breakfast like the Lodge. 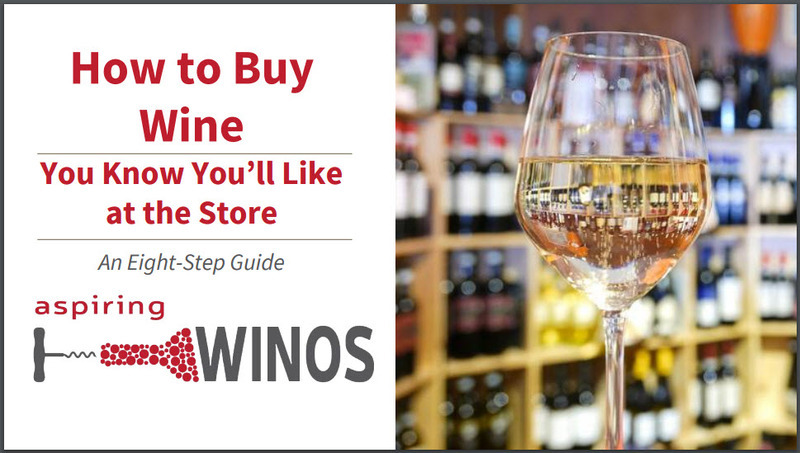 If you’re a true wino, pick up a bottle of wine on your way into town, to enjoy before bed in your room. After you check in, take a stroll around the gorgeous Riverfront Trail (which, pro tip, is totally accessible!) and pick one of the restaurants that looks out over the Columbia Point Dock. 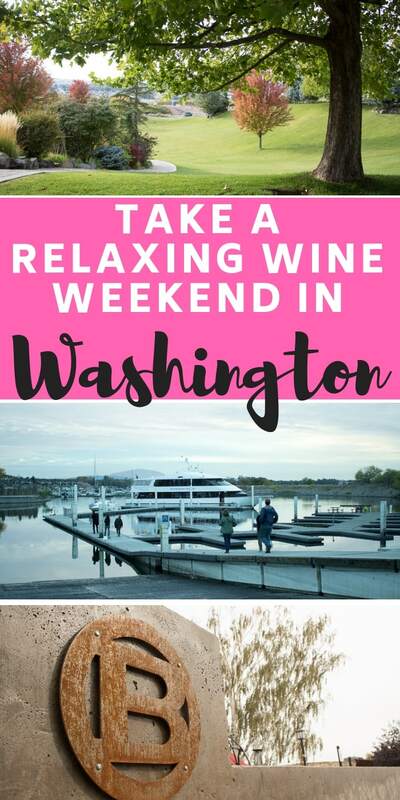 If you’re lucky, you’ll catch a sunset while sipping on some delicious Washington wines. There’s four solid restaurants within walking distance, all featuring delicious seafood and great views. Take a stroll and pick one out, or make a tired, post workweek beeline to the one that fits your mood the best! After a toast to the start of a delightful weekend, stroll back to your room and crack open some wine to chat and enjoy the views, or pop into Vine Wine & Craft Bar at the Lodge at Columbia Point for a nightcap made with locally distilled spirits. You’re going to need some chocolates. Okay, okay, you want to start with coffee, like a non-chocolate-caramel-obsessed person? Head to a Roaster’s Coffee location, like the one located a 1.4 mile (20 min or so) stroll along the Riverfront Trail. It’s got a very local vibe when you step in the door, with people having fun making coffee. Of note, at least this location does not carry food, so you can get your caffeine fix, but not breaky. Maybe you get a caramel mocha and start your chocolate fix for breakfast… I’m not judging. With a beverage of your choice in hand, it’s time to peruse. It is the morning and you have CHOICES my friend. I’m referring of course to the slate of farmers markets available in the Tri-Cities area. I think I have a homing beacon for farmers markets, as I can accidentally find them while we are on vacation all the time. I love them. Jeff wonders how I manage to stumble upon them, seemingly by accident. He’s even accused me of orchestrating our plans in order to visit farmers markets. Now that you’ve got your vegetables (okay really your cheeses and meats for your picnic), it’s time for chocolates. Yes, it’s still morning. Yes, you need chocolates. Head to Baum’s House of Chocolates and buy a big box of the Sea Salt Caramels. You won’t regret it. They also make wine barrel truffles, which are infused with Washington wines. Based on my sampling of those two items, the rest of their selection is probably pretty darn good, too. I got to taste test these thanks to the wonderful gift bags Visit Tri-Cities hooked us up with. Take a look! 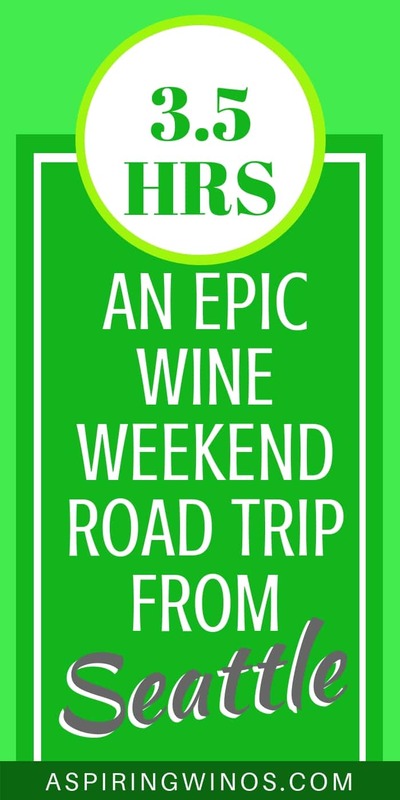 Are you ready to hit the wineries? Excellent, me too! 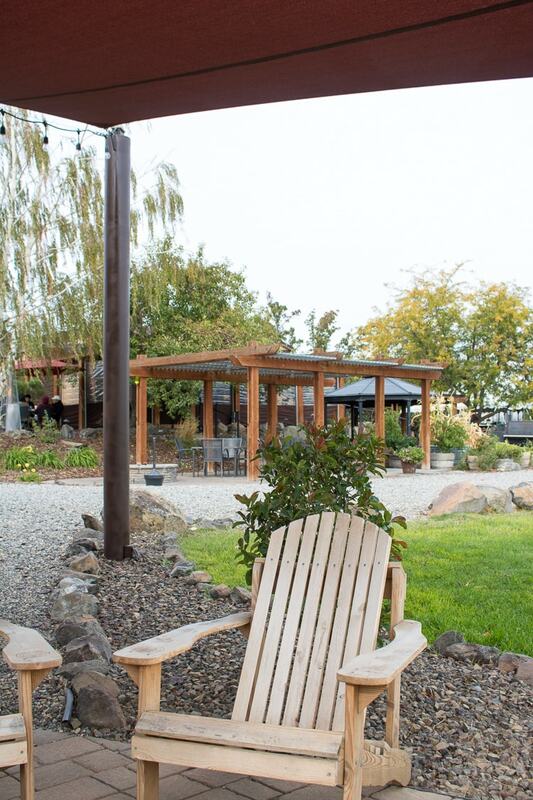 Head over to J. Bookwalter Winery and check out Fiction restaurant for lunch, which is only an 8 minute drive from the hotels. Executive Chef Fransisco Mendoza serves up delicious food for extremely reasonable prices. He is into creating preserves and pickling all sorts of things! We had a fascinating selection, including some spicy pickled items that somewhat caught me by surprise (even though I was warned, I totally forgot and made some awesome facial expressions for everyone around me). I can’t say enough good things about the Double Plot Chardonnay. Everyone else in our group was drinking their top of the line reds, like the 2014 Chapter 7 Cabernet and loving them, while I couldn’t get enough of the Chard. 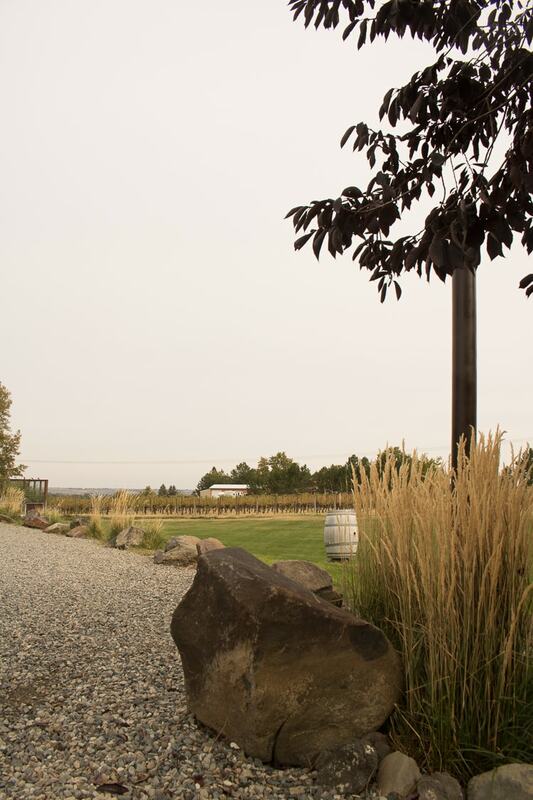 The grounds at Bookwalter are also a wonderful place to lounge, they have beautifully crafted spaces for lounging with various size groups, plus corn hole, lawn bowling and an amazing, in-the-vineyard view, despite being less than ten minutes from town and maybe five minutes from Walmart! 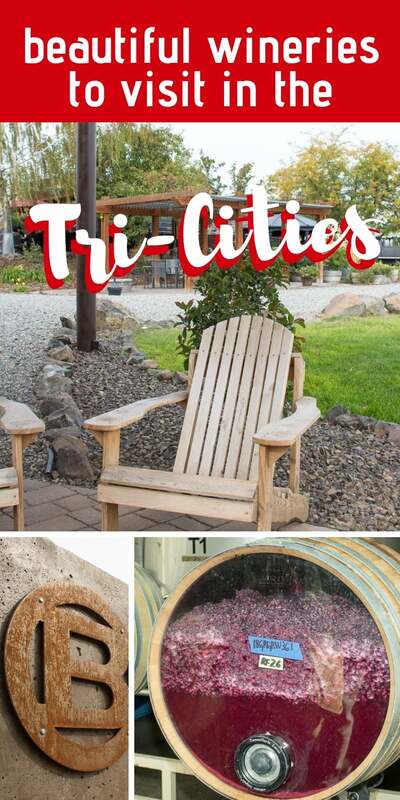 Being so close to town, with such incredible wine and food, this is a must-visit place in the Tri-Cities. 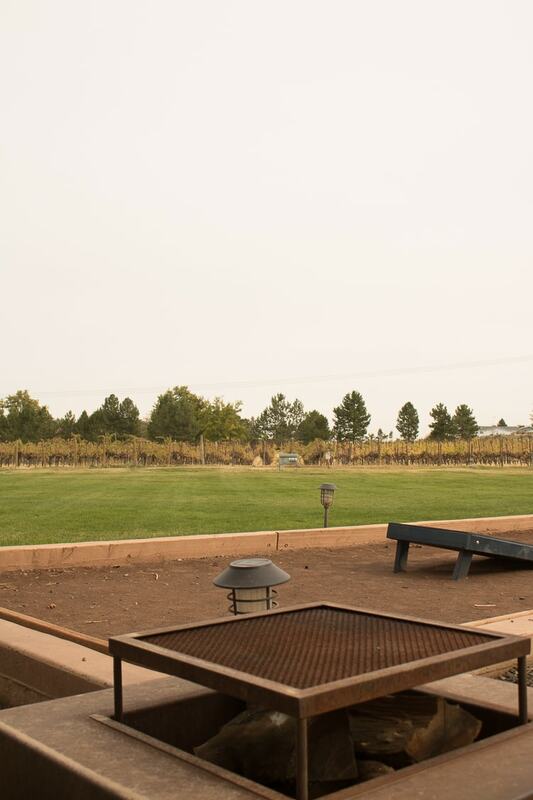 There’s a fire pit next to the lawn bowling AND corn hole, all while looking out at vineyards. 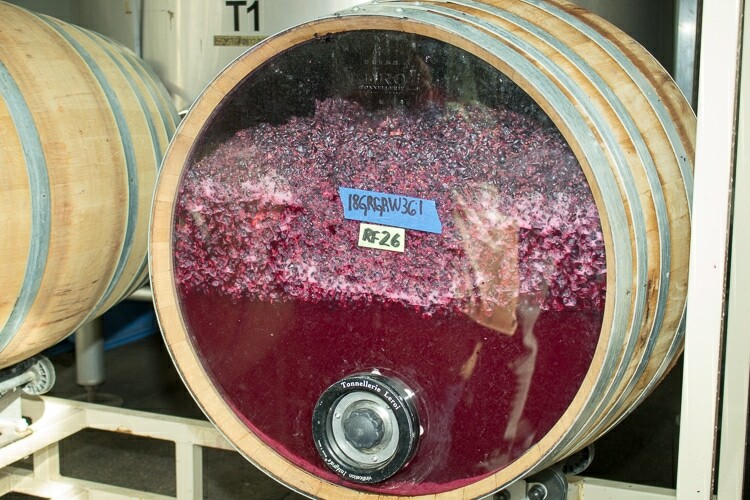 From J. Bookwalter, it is a quick fifteen minute drive up to the Red Mountain AVA. It is home to many vineyards and a bit shy of a dozen tasting rooms, not quite within stumbling distance of each other, but only a minute or two in the car. 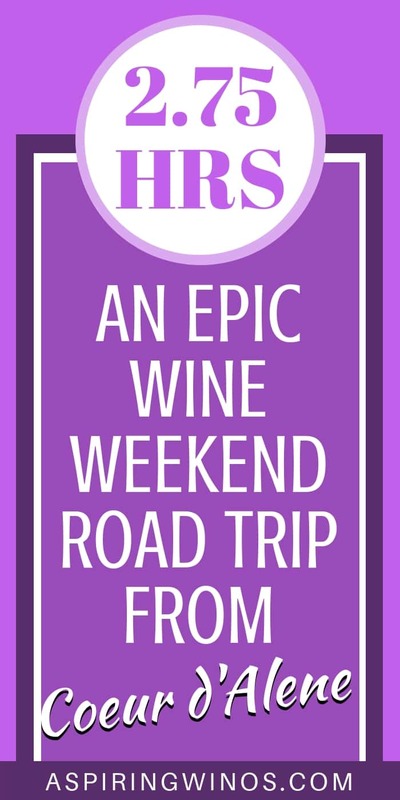 A reminder, as you’re about to try some more wonderful Washington State red wines… you need a designated driver! 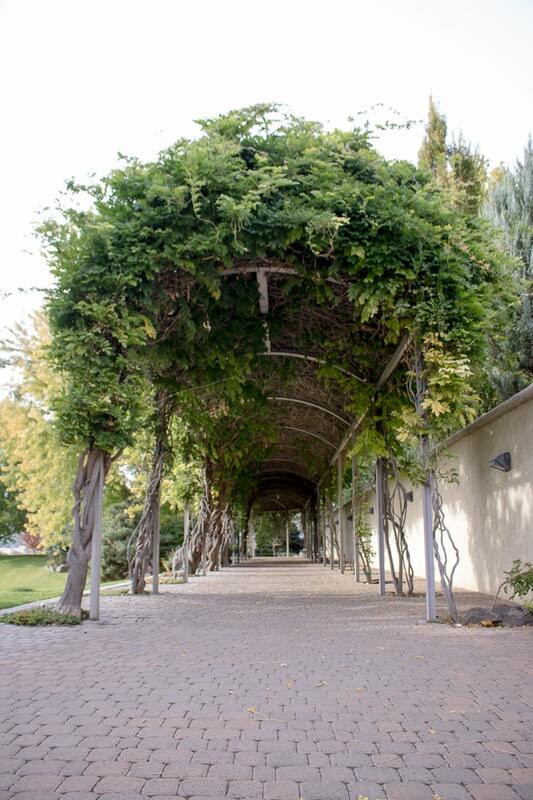 All of the gorgeous grounds are around the winery and restaurant, which is a converted home. We visited Terra Blanca Vineyards on our trip and it was absolutely gorgeous. 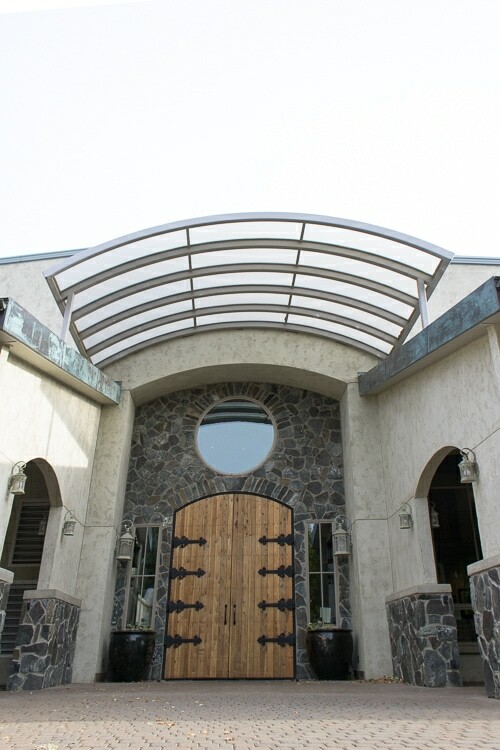 As a newer facility, it was custom built as a wine tasting room and it shows. You’ll be able to take stunning instagram shots of the tree and vine lined pathways, huge stone doors and more. That is, of course, after you sip wine out on the covered patio, overlooking this view! Does this beautiful door at Terra Blanca not scream “Instagram me”? From there, you can head to any of the many wineries, including the famed Col Solare, which is a partnership of icons in the wine world. With the Red Mountain AVA being so young, the wine tourism experience is top notch, with beautiful spaces and beautiful wines, all built in the past decade or so. There are few places licensed to sell food, up on the mountain, so as you enjoy your winery hopping, pull out the picnic foods you picked up in the morning! Another stunning vista from the Terra Blanca winery. All 3 of these pictures were taken within 25 feet of each other! 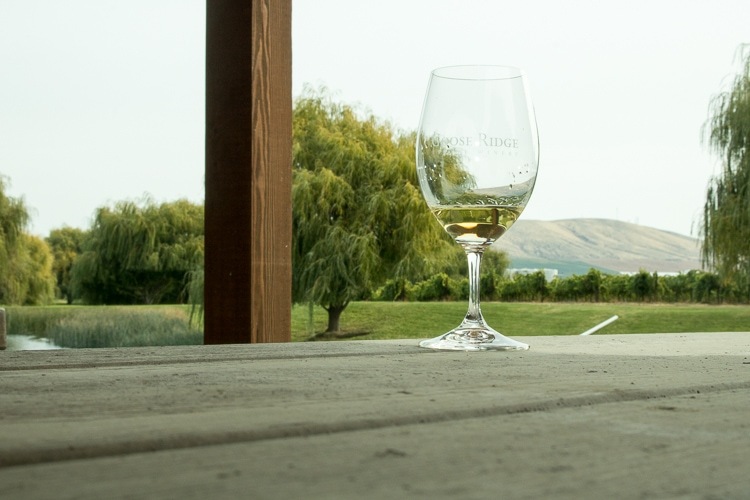 Break up the drive back to your hotel (ahem, it’s 15 minutes, but I don’t want you to go that long in wine country without options) by stopping at Goose Ridge Vineyard’s Richland Tasting Room. If you’ve got some cider fans in your group, they’ll be in luck, because they make some delicious ciders and have extensive apple orchards. A ridiculously cool barrel that rotates in order to do punch downs at Goose Ridge Vineyards! You can see the fermentation process as it happens. When you’ve filled the trunk of the car with enough cases of wine to call it a day, head back to your hotel to change and take a wee break. If you’re me, this actually means cramming a shower in and changing, before heading out for your next adventure! Goose Ridge has some private spaces available for booking with spectacular views. We were treated to wine, cheese and cider with this view! Ready for one of the highlights of the trip?? 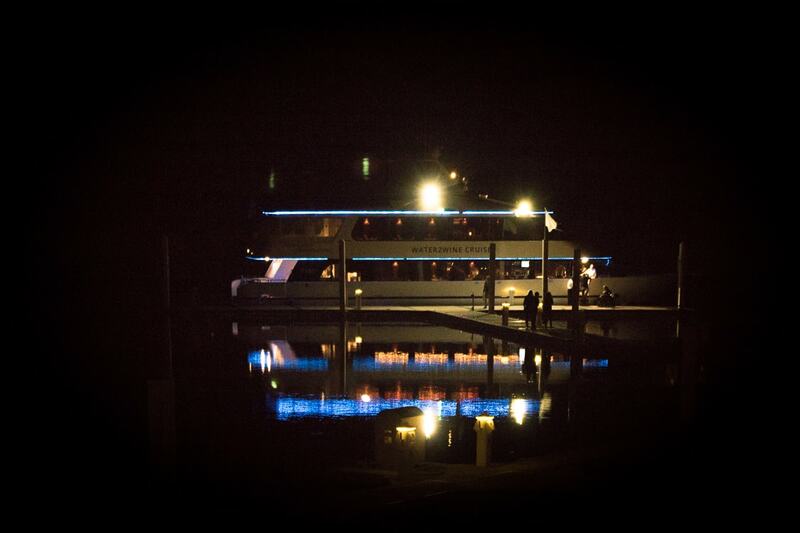 Take a Water 2 Wine Cruise on the Columbia River for Dinner! They depart from the marina immediately in front of the hotels and you get to spend an evening watching the sunset from the river, while sipping on wine and making new friends. If you’re less extroverted than me, you can also get a private table, don’t worry. The cruise provides romantic wow factor, if your road trip is with your love, and an all-around memorable experience if you are with friends. 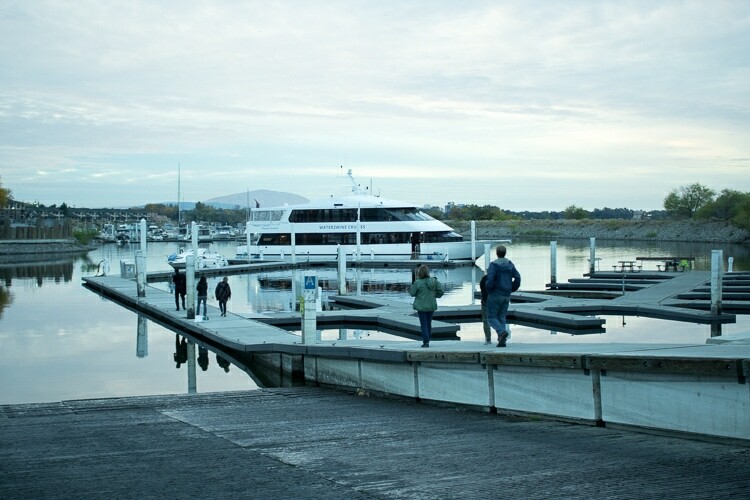 Stroll onto the boat from the Columbia Point Marina, literally outside your hotel! The views are stunning and you can see them from upstairs or downstairs on the yacht. They also serve a plated four course meal, which is delightful. By the time we went on the Water 2 Wine Cruise, we had been on the road for several days and were very tired of dealing with food allergies. Very tired. If you were the designated driver this afternoon, now is the time to kick off your shoes and enjoy the wine! Docking right in front of the hotels, you’ll only need to walk back to your room after your cruise. The pathways are well lit and the evening atmosphere of outdoor diners and the twinkle of the lights on the water caps off a perfect day full of memorable things to do in the Tri-Cities and Washington wine country. What a wonderful way to finish the evening! Feel free to finish off your night with some chocolates. You’re being fancy. Turn down service comes with chocolate, so you should have some, too. That’s what I figure, anyway. On Sunday morning you have to start rationing your chocolates, because you’re about to head home and they won’t last forever. I allowed myself one per day until I ran out. I kept them in the fridge at home, then had 15 minutes of anticipation as I let the caramel get nice and room temperature melty. To justify all of this chocolate consumption, you’re going to want to do a stand up paddleboard yoga class with Northwest Paddleboarding. The best part is they’re located right outside the hotels, so you can sip some coffee and saunter over. If you’re not the yoga-in-the-morning type, you can get the rest of your group to go, while you sip your coffee and judge their downward dog skills from the comfort of your room’s balcony. Having done your sun salutations, it’s time for brunch. 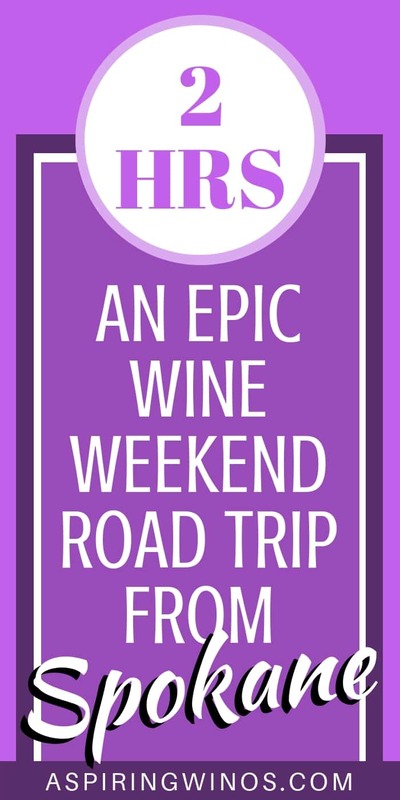 No weekend road trip is complete without it, right? Head over to Lu Lu Craft Bar + Kitchen for a delicious brunch. When you’re done with brunch, alas, your 36 hours in the Tri-Cities wraps up and it’s time to head home. Now is when you have to really start rationing those chocolates, mmkay? Don’t eat them all in the car on the way home. 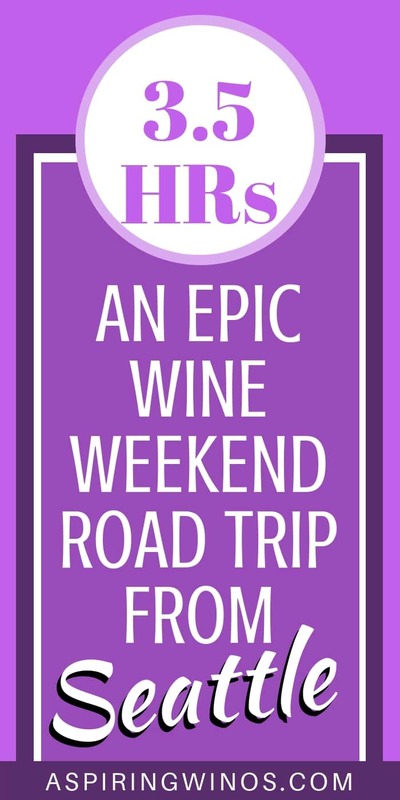 By now you’ve popped an email off to your girlfriends, or your other half, with a link to this post and a “Hey want to check out the Tri-Cities next weekend? It looks awesome.” right? It’s a wonderful, completely accessible and affordable place to spend a weekend with friends, I’m so glad that we went and I definitely recommend it. There’s also a ton of cool science tourism that we didn’t even have time to check out, golf that is NOT my jam and hundreds of wineries in the vicinity. 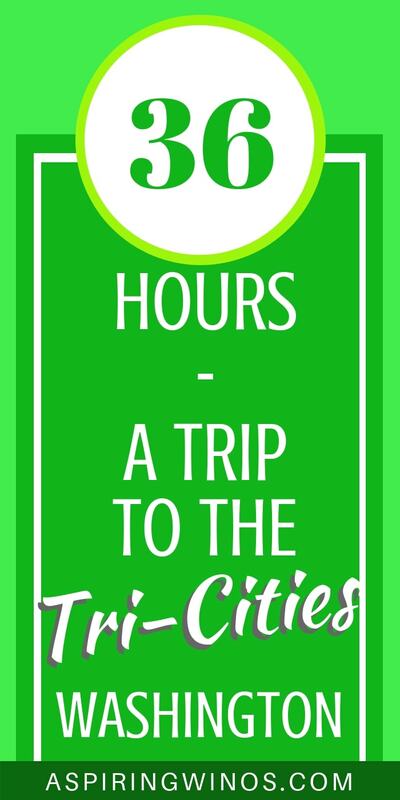 Have you ever traveled to the Tri-Cities, WA? Do you want to go now? Let me know in the comments! Nice article, Anne! It’s been too long since we visited Red Mountain. We have often stopped at Taverna Tagaris for lunch on our way back to Seattle from Walla Walla, however. Thanks for the compliment, Nancy. 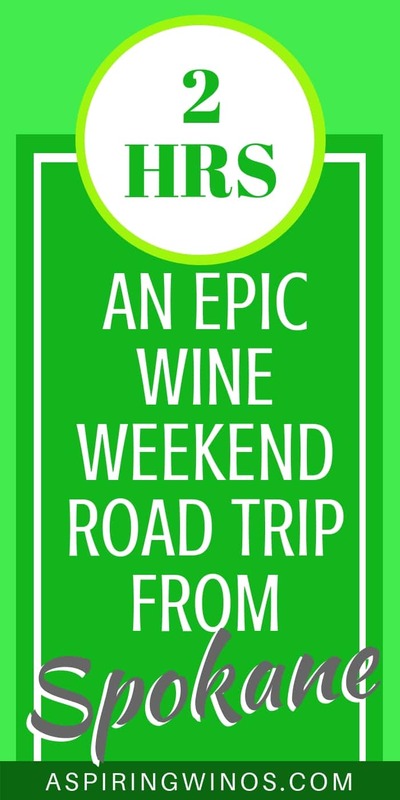 I would have loved more time to explore the area, there’s tons of great wine and food happening! Wonderful article about our adopted new home. But you missed one of the best chocoholic sites, Country Mercantile. There are two locations here. It’s a wonderful eclectic store that makes its own chocolates (Heaven!) and is full of thousands of unique sauces, bruschetta spreads, spices, etc. Also a casual deli-mexican lunch counter and great ice cream. It’s very close to Goose Ridge Winery, so you totally could have stopped there. Their chocolates are fantastic!! You’ll have to come back. A reason to have more chocolates? I’m in! Thanks for your comment, Karen. I’m so glad you liked the article! 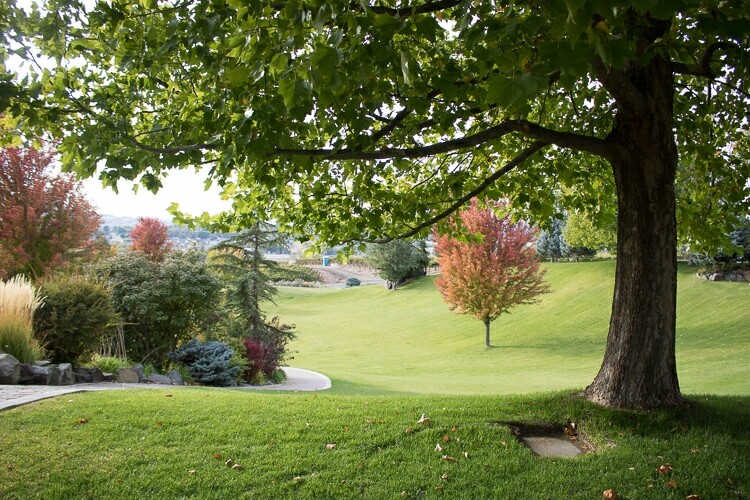 The Tri-Cities is a wonderful place to call home! In addition to all you’ve mentioned, we have three rivers providing numerous water activities, hiking trails and gorgeous parks. Its a great place to visit and if you are looking to make a move Krista Hopkins Homes can help you make this a place to stay, as well! Thank you for the nice article.